Picture this: you wake up in the morning relaxed, full of creative energy, and eager to arrive at your place of work. Before you roll your eyes and dismiss this idea as nothing more than wishful thinking, consider this: the level of job satisfaction is directly correlated with the physical work environment. In other words, changing the way your works space looks can help you clear your mind of stress and make you fall in love with your job all over again. While stress is an unavoidable by-product of modern lifestyle, that doesn’t mean you should let it get the best of you and prevent you from reaching your full potential at work. So instead of throwing up your hands in despair when the going gets tough, look around you and find ways to change your physical environment in a way that will help you relax and unwind. Keep reading to find out some of the most ingenious ways you can make your business office a stress-free zone. Despite the increasing alienation of the digital era, the innate need of every human being to be in contact with nature has never really gone away. The cold and isolating work environment of modern office buildings often makes us forget that our senses thrive best in exposure with the natural world, which is why we need constant reminders that we are one with nature. And what better reminder of our connection with nature can we ask for than an indoor plant? You would think that something so simple such as a plant would go unnoticed in a busy office, but just give it a try and you’ll soon notice a dramatic decrease in stress levels. One study found that interaction with indoor plants reduces physiological and psychological stress by providing the nervous system with calming stimulation, lowering blood pressure, and promoting feelings of comfort and serenity. Don’t worry, all you need to do is take a trip to your local flea market and ask for aloe vera, English ivy, snake plant, philodendron, and peace lily. These five plants have been proven to have a calming effect in a work environment. Not only will these lovely greens freshen up your office and help keep the indoor air clean and healthy, but they’ll also work their magic by reducing stress among your team members. Feng shui has become so popular among office designers that a number of leading brands – including Nike, Coca-Cola, Sony, Shell, Procter & Gamble, McDonald’s, Virgin Airlines, Citibank, Disneyland, and Hilton hotels – rely on this ancient Chinese practice to help their employees feel more comfortable at work. But exactly is feng shui and how can it help you create a stress-free work environment? Feng shui is an architectural theory that has been around since at least 4000 BC. It is primarily based on the belief that we can enhance our environment by arranging objects in accordance with the natural forces of the universe. Feng shui designers take into account everything from the choice of color to door placement to create a peaceful and productive environment. If you want to transform your hectic office into a calming oasis, the first thing you need to do is de-clutter your workspace. Clutter is synonymous with chaos and confusion which makes it one of the main sources of work-related stress. Desks should be positioned in such a way that the people aren’t directly facing one another as this can lead to irritability and increase the chance of conflict. You should also strive to create a balance between opposing colors, materials, textures, and surfaces in order to encourage positive energy flow and induce relaxation. Did you know that the presence of a pet can help regulate blood pressure and can actually lower the level of stress hormone cortisol? Petting a dog has also been found to stimulate the production of oxytocin, a hormone that plays an important role in human bonding. Bringing a pet to work doesn’t just provide stress-relief, but it can also improve your relationship with your colleagues and boost productivity. Since pet-owners are perceived as more approachable and appealing, taking your cat or dog to work can help you build trust and strengthen the bond with people at work. But before you and your employees start bringing your furry friends to the office, you need to make sure that your workspace is pet-friendly. First, check that everyone’s on board with the idea of having animals around while they work and lay down pet-related ground rules. Let everyone know what types of pets are allowed and make sure your colleagues understand what kind of pet behavior is acceptable at a place of work. Finally, don’t forget to take into account the pets’ basic needs such as food, water, beds, toys, and leashes. Since you can’t expect people to leave their work every few hours to check up on their pet, it’s a good idea to invest in an automatic pet water bowl so people can focus on their work without worrying about their cat or dog becoming dehydrated. The connection between the colors we’re surrounded by and our moods is well-established. Research on color psychology has shown that colors have a powerful effect on the way we feel. These findings underpin the choice of color across many different areas of business – from art and advertising to interior design and architecture. The way people respond to colors in the environment may vary since preference for certain colors is the result of cultural conditioning and depends on a number of factors, including age, gender, and past experiences. Still, research shows that there are some color schemes that are universally perceived as positive and relaxing. So what colors should you pick to reduce work-related stress among your colleagues? Hues that have been proven to have a positive emotional effect on most adults are pale blue, olive green, tan, pastel grey, light yellow, and lavender. Olive green is the color of nature and introducing pops of this color into your workspace can help lower the stress response and soothe the nervous systems of your colleagues. 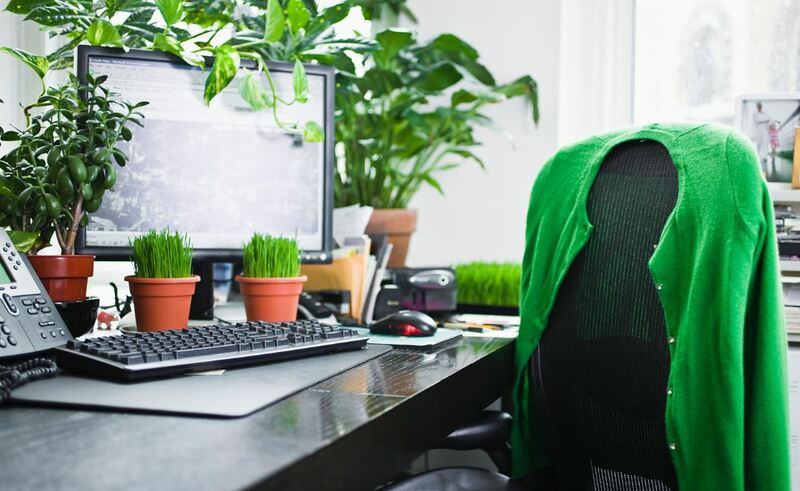 Green is an especially useful color to have in offices where people work long hours since it doesn’t cause eye strain and helps maintain a stable level of productivity throughout the day. Tan details will make your office warmer and more comfortable, while grey is a more appealing alternative to the cold and impersonal all-white walls. Tan also evokes sensations of stability, security, and safety, all of which are important if you want your office to be a stress-free zone. Light yellow and lavender are optimistic colors and are frequently associated with the freshness of springtime which makes them an ideal choice for a dull office environment that lacks a bit of cheer. The color blue brings to mind the serene images of clear skies and open seas, which can help you and your colleagues feel more calm and relaxed during busy work days. One solution would be to paint the entire office in a soft shade of blue and then add pops of other stress-relieving colors that will complement the overall look of the office. In other words, modern science has now confirmed what has been known to our ancestors since the old days: namely, that music has the power to heel our soul and quiet our busy minds. Listening to music triggers the release of dopamine, a “feel-good” chemical that has a direct effect on the way we experience pleasure. The sound of your favorite tune can also lower the levels of stress hormones cortisol and epinephrine, provide relief from negative thoughts, increase your focus, and boost motivation. Other proven health benefits of listening to music include improved memory, better cognition, pain intensity reduction, greater quality of sleep, and elevated mood. Music also plays an important role in building and maintaining strong interpersonal bonds, which means playing music in your office can help you create a harmonious and productive work environment. Before you start blasting your favorite album in the office, make sure that all of your colleagues are in favor of this idea – forcing music on people can have the opposite effect and create discord among employees. Get all your colleagues involved and create a playlist that will suit everyone’s taste or take turns to pick a different radio station each week. Keep in mind that music in the office shouldn’t be a distraction, so adjust the volume level and steer clear of abrasive as this can have a counterproductive effect and cause even higher levels of stress at the workplace. So what is the main takeaway from all this? Stress at work often comes from the disharmony between us and our physical environment. Not only can uninspiring design make you hate the thought of spending yet another day among the doom and gloom of your office, but it can actually have serious consequences on the long-term success of your business. A poorly designed workspace can exacerbate stress among employees and lead to a host of problems, including low productivity levels, reputation damage, and loss in revenue. The good news is that sometimes even a small change in the way your office looks can have an enormous impact on the morale of people you work with. While you may not be able to eliminate stress for good, indoor plants, cleverly positioned furniture, a man’s best friend, a relaxing color scheme, and some soothing tunes can make a world of difference in the way you and your colleagues navigate the curves of office life. Hello everyone, divorced recently. I decided to buy a home suited for my family. I didn’t have the best track record with funds in my past and my credit profile was faulty. My credit score was 521 and I couldn’t apply for a mortgage, I was desperate to get a roof over my head which almost led to the detriment of my family. I read some good reviews about Creditrepairmannetwork on Google and different credit sites then I contacted him. Within 8 working days my score was raised to 796 and erased all the negative items on my credit report. This is the best thing that has ever happened to me and my family, I’m totally grateful to him for such services given to me. I firmly recommend creditrepairmannetwork to you all in need of such services and get your credit issues fixed in a short period. Email Creditrepairmannetwork@gmail.Com They can fix a Chex system and a DUI report as well. Cheers. I guarantee you Creditrepairmannetwork@gmail.Com is for real. I had few collections and couple of late payments on my report and also my score was at 410 this specialist put a smile on my face when I contacted him through a recommended site, he has helped a lot of people in the states and he did the job as he promised in 7 business days, deleting the negatives on my profile and increasing my score to a whopping 746 and all late payments were marked as paid, I’m forever grateful to him for coming to my rescue. You can hit him up via his email. if you needed a trusted hand and don’t want to be scammed anymore.